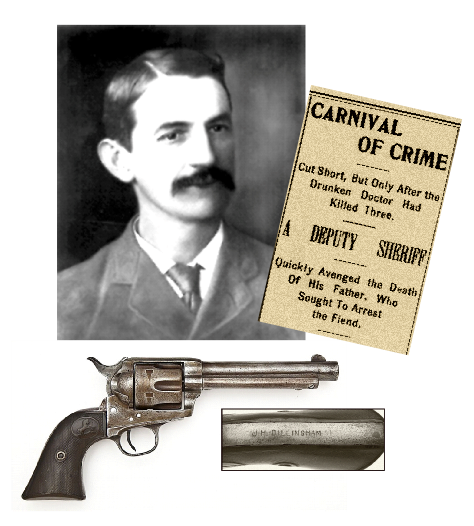 On August 20, 1900, Sheriff John Henry Dillingham of Platte County, Missouri, was summoned to the sleepy little town of Farley over a case of multiple murder. A local physician named Sterling Price “Sturley” Harrington had gone on a day-long, drug and alcohol fueled killing spree. Taking his ten-year-old daughter along on his bloody errands, the doctor shot and killed his mother-in-law in cold blood, then calmly drove to the home of his wife’s uncle and killed him as well. He drove across the state line into Leavenworth, Kansas, where – apparently with further killing in mind – he resupplied with ammunition and more weapons before returning to Farley. In what was likely part of an addle-brained plan to escape, Harrington tried to rob the town’s general store, and engaged in a point-blank shootout with the store’s clerk. About this time Sheriff Dillingham arrived with a trio of deputies, one of whom was his son, Henry. As the lawmen approached the store, Harrington met the sheriff at the entrance, the two men exchanged shots, and Sheriff Dillingham was killed instantly. As the murderous doctor fled toward his wagon, Henry Dillingham fired three times and Harrington fell dead in the street. Sheriff John Dillingham’s eventful career and the tragic events leading up to his death are detailed in Chapter 8 of Some Gave All. This entry was posted in Uncategorized on August 20, 2018 by J.R. Sanders.